In what Ryan Devereaux writing for The Intercept called a "gesture at transparency," the Obama administration has put forth what is arguably its biggest lie among many big lies. There is much to cry about and a little to laugh about in the three page summary of his executive order. What could be funny in a report claiming that between 65 and 116 innocent children, grandparents, aunts and uncles had their lives snuffed out by flying killer robots in areas the U.S. seeks to control but can't be bothered to declare war on? Dark humour abounds in the absurd statements of an administration that gives the impression of drinking its own Koolaid. consistent with the President's commitment to providing as much information as possible to the American[sic] people about U.S. counterterrorism activities. This is absurd because Obama is regarded as the least transparent president in history, exceptionally committed to persecuting whistleblowers, as chronicled by publications from Democracy Now! to the Wall St. Journal. Here's another one: "areas of active hostilities include Afghanistan, Iraq and Syria." By means of this euphemistic phrase, the Obama administration avoids including the considerable number of civilian deaths in those unfortunate areas. It limits its body count to air strikes in Libya, Pakistan, Somalia and Yemen -- countries most people in the U.S. would be hard pressed to locate on a map. But perhaps you would agree with me that if the U.S. is sending flying killer robots to surveil and bomb your neighborhood over the course of several years, you live in an "area of active hostility." The U.S. Government remains committed to considering new, credible information regarding non-combatant death that may emerge and revising previous assessments, as appropriate. This will become "appropriate" when hell freezes over if the capital G government's disregard of several careful examinations of data on drone strike deaths is any indication. Mostly because the previous assessments would need to be multiplied by eight in order to align with, for instance, the Bureau of Investigative Journalism's careful methodology. 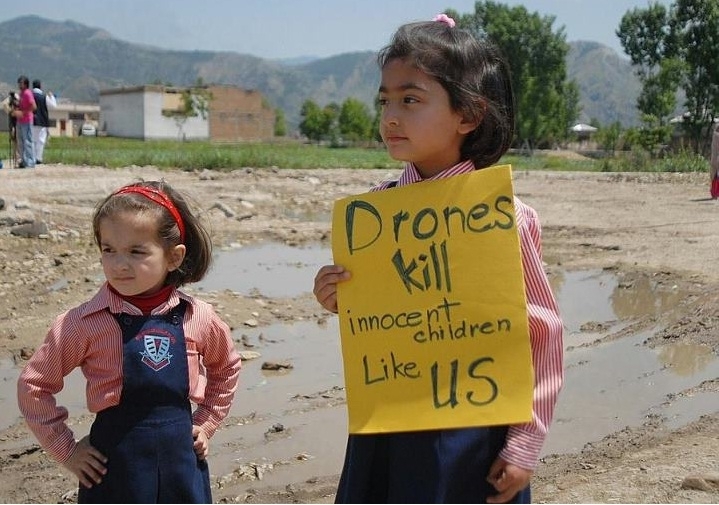 The Long War Journal and The New American Foundation have also carefully counted far more civilians killed by drones than the Obama administration cares to. Does the Obama administration believe its own lies? Possibly not, since the "news" came in the form of a pronouncement on a long holiday weekend. The U.S., as we know from Obama and other cruise missile liberals, is hella exceptional. The thing about exceptionalism is it leads to the hubris that guarantees its own downfall. Ignorance about geography on the part of my fellow USians is but one symptom of our exceptionally fatal affliction with imperial hubris. This ignorance is useful and is probably nurtured in the cradle by the misnomer "America" which treats two enormous continents as our very own soveregn nation. Research indicates the more misinformed they are about a country's location, the more inclined they are to invade it. Although this finding was in regard to Ukraine, it is credible that U.S. constant violent intervention in the affairs of countries south of our border is given a pass by people trained to consider it all "America" anyway. Independence Day celebrates the successful tax revolt of settlers chafing at the financial burdens of a bloated empire waging wars far beyond its borders for years on end. An endless stream of blowhards will claim in speeches on July 4 that justice and liberty for all was thus established on the rich continent of North America. No such thing has ever occurred, but white privilege makes the claim plausible to the type of people who think corporate "news" is reliable information, and who believe the U.S. has only killed 116 innocent people in 473 drone strikes.